Okay. There’s no need to be scared or read into this. Just because the last two times we’ve been to the World Series we’ve been able to sweep and get it done in four games doesn’t mean that we’ll lose the World Series just because we lost the second game. It’s fine. Honestly, we shouldn’t even have lost this one. My point is that there is plenty of baseball still to be played. True, we’re going away now, but that hasn’t stopped us before. We’ll just have to get past it. So Lackey did a great job while he was on the mound. He pitched six and one-third innings and gave up five hits and two walks while striking out six. He gave up a single in the first, a single in the second, and nothing in the third. He cracked in the fourth when he gave up a triple to lead it off that turned into a run on a groundout. That one run was a big deal because we had yet to score. We went down in order in the first, and Napoli walked to provide our first baserunner in the second. Ellsbury provided our first hit in the third with a single, and the bottom of the fourth looked promising. Pedroia doubled and Papi walked, setting up Napoli. Who then grounded into a double play. Lackey went one-two-three in the fifth; Salty walked in the bottom of the inning, but that was it. Lackey gave up a single in the sixth, and in the bottom of the inning, it looked like the game might be ours after all. I’ve often said that, in a close game, one run feels like ten. This one was no exception. Because the longer you go without scoring runs, the more difficult it feels to score them. After Victorino grounded out, Pedroia walked, and then it was Papi’s turn. And I was busy thinking how great it would be if he just went yard, just like that, just because we really needed him to. He took a fastball for a ball, fouled off a second fastball, and then received four straight changeups. He took the first for a ball, the second for a strike, and the third in the dirt. And he went yard on the fourth. Hit that ball into the Monster seats. Seriously. Just like that. Just because we needed him to. It was huge. It didn’t tie the game. It gave us the lead. In a close one. In which scoring one run felt like scoring ten. And as a result of that phenomenon, scoring two runs on one swing felt like a real jump out in front. Unfortunately, the whole thing unraveled in the seventh. That can not be overstated. Literally the whole game was completely undone in the seventh inning alone. It was one of the worst innings you can possibly imagine to occur during, of all things, the World Series. Honestly, that kind of bad baseball is not even excusable during the regular season, let alone the postseason, let alone the pinnacle of the entire postseason. Lackey led off the seventh with a strikeout. Then he issued a walk and gave up a single, so John went with Breslow. The Cards managed to execute a double steal, putting both runners in scoring position. And Breslow walked his first batter to load the bases. A double play would have ended it all. But Breslow induced a sac fly. Technically, that’s not so bad; you take the out in exchange for the run, which in this case would not be winning but rather tying. But the whole thing went completely and epically awry. I saw it with my own eyes, and I couldn’t believe it was happening. I think that that had something to do with the fact that I didn’t really want to believe it was happening. Not one but two runners scored on the sac fly, indeed providing the Cards with the winning run. Salty missed the catch, Breslow made an error on the throw, and the whole thing turned into a huge mess as a result. And then, to top it off, Breslow gave up an RBI single. Thus, while Lackey was charged with three runs, he was also the victim of a situation in which some of them scored on someone else’s watch. The final score was established right there. We lost, 4-2. Tazawa pitched the last out of the seventh, after which we went down in order. Workman pitched the eighth, which for us looked like it had some potential. Ellsbury reached on a fielding error, and Papi singled two outs later. But Napoli popped out to end it. Uehara pitched the ninth, after which we went down in order. So at one point the game looked like it would be really good. Then it was really, really bad. All because of one play that was supposed to be routine but that instead cost us Game Two. We need to pull it together. Not only were those errors completely inappropriate for the World Series, but we also didn’t even have enough hits or runs to absorb that damage. At the same time, I saw too many swing-and-misses and too many stare-at-strikes. All of that needs to change immediately. If we’re going to get this done, we need to take the proper steps. In other news, hockey is back in Boston as the Bruins began their new season this month. So far, we’ve beaten the Lightning, Red Wings, Panthers, Lightning again, Sabres, and Sharks, and we’ve lost to the Avalanche and Red Wings. Just so you know, this is not going to be a happy post. First of all, it’s pretty much unofficially official. Theo is going to take over the Cubs. It’s a five-year deal, and the only thing left is for the two clubs to agree on compensation since Theo is technically entering the last year of his contract with us. The deal is currently worth twenty million dollars, which reportedly includes said compensation. As of late, Theo’s title within the Cubs organization is unclear, but it supposedly is something higher up. The bottom line is that he’s leaving us, so we’ll have to find a first-base coach, a manager, and a general manager. Here’s an understatement: this offseason, we’ve got some serious work to do. With any luck, we won’t actually have to find a general manager and will instead be looking for an assistant general manager; I wouldn’t mind having Ben Cherington take the helm. That’s where it looks like we’re headed, anyway. He’s been included in all club dealings so far during the offseason. He’s been Theo’s right-hand man for years, and the two of them started with Larry Lucchino in San Diego anyway. It obviously won’t be the same, but it’ll be pretty close. That is, if you like the job Theo did. Sure, he made some huge mistakes. Eric Gagne and Dice-K were the most notable of those; if Jenks doesn’t recover properly he’ll be another, and if Crawford and Lackey don’t turn it around they’ll be a third and fourth. But I would argue that his good so epically and completely eclipsed his bad that this discussion isn’t even necessary. His drafting and farming decisions were legendary and include Pedroia, Ellsbury, Youk, and Lester. He is the youngest general manager to be hired, and he is the youngest general manager ever to win a World Series. After almost delivering us in 2003, his first season, he lifted us out of the Curse of the Bambino in 2004 and reminded us that we weren’t dreaming in 2007. His acquisition of Gonzalez was absolutely masterful. He brought sabermetrics to Boston and made it feel at home here. He wasn’t just a professional removed from everything; he was a baseball guy and, worth noting, a Red Sox fan. He’s from Boston, specifically Brookline about two miles from Fenway Park, and that’s something Chicago will never change. Chicago’s dysfunction as an organization goes well beyond any single position that Theo could possibly fill. Make no mistake; he won’t simply waltz in there and have them winning World Series left and right. If he could do that in Chicago, we would have been winning every single World Series title since his takeover of our team, and clearly that didn’t happen. And if it didn’t happen here, it’s not going to happen there. But that’s neither here nor there. This is about what Theo did for this city in his nine memorable years here. He brought a new approach to the game and put the pieces in place for us to win. He established a winning culture here. He’s a genius and will be sorely, sorely missed. Here’s to you, Theo. Here’s to everything you’ve done for us and for the game of baseball. Here’s to the good, the bad, and the ugly, and here’s to smiling through all of it because, all along, in Theo we trusted. We know that other fans in other places rooting for other teams will be trusting in you from now on. But we also know that you can take the general manager out of Boston but you can’t take Boston out of the general manager. We just hope that the great things you’ll accomplish will not be at our expense. Secondly, all of the pieces to the devastation puzzle are now coming to light. It’s an ugly story. Here goes. It wasn’t one pitcher responsible for the beer-drinking between starts. First of all, it wasn’t just drinking beer; it was also ordering in fried chicken and playing video games. Secondly, it wasn’t just one pitcher; it was three. Beckett, Lackey, and Lester. I never thought I’d see Lester on that list, although I should point out that the degree to which he actually participated in these goings-on is highly speculative, and it’s possible that he wasn’t really a mainstay. Apparently they not only drank beer but ordered fried chicken and played video games, all at the expense of working out, and they were starting to get more players involved. All I know is that when we needed them to deliver most, they didn’t, which is unusual for them so something must have been going on. We knew they were health, so that should have tipped us off, but I never thought I’d see the day when such people would actually knowingly put on pounds and thereby sabotage everything the team worked for. It’s sacrilegious. 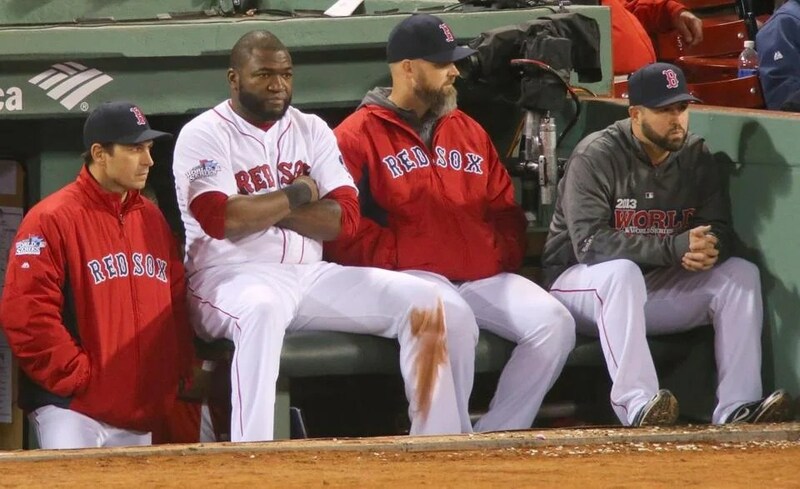 Pedroia probably couldn’t believe his eyes and must have been seething. Meanwhile, Tito was losing influence with both old and new guys, he was having health issues, and he was living in a hotel due to marital issues. He insists that the former wasn’t due to the latter two, but I’m also sure that Beckett, Lackey, and Lester insisted that their very visible extra fat and subsequent tanking wasn’t due to their clubhouse habits either. I’m actually inclined to believe Tito, though; he’s focused, dedicated, and committed, and we can’t just assume that he doesn’t know how to handle personal issues in his life and balance them with his job. Then, apparently, the team accused the brass of caring about money more than results when they scheduled the doubleheader in response to Hurricane Irene. Then the veterans on the team, including Tek, started pulling back on leadership. Wake exacerbated this problem by calling for a return next year so he could break the all-time wins record; neither the time nor the place when you’re days away from playoff elimination. And Youk, as you can imagine, was more of a clubhouse pain than usual, which we all knew but didn’t feel because all of these other issues weren’t present before. At least, if they were, we didn’t know about them to this extent. Youk was the only player to call Ellsbury out for his time on the DL last year due to his rib injuries. And it’s obviously admirable and dirt-doggish indeed that he played through his injuries this year, but doing so apparently brought the worst out of him socially in the clubhouse. And when you’re hanging on by a thread in the standings, that is so not something you need. Gonzalez, of all people, joined in the pettiness by complaining about the late-season schedule. 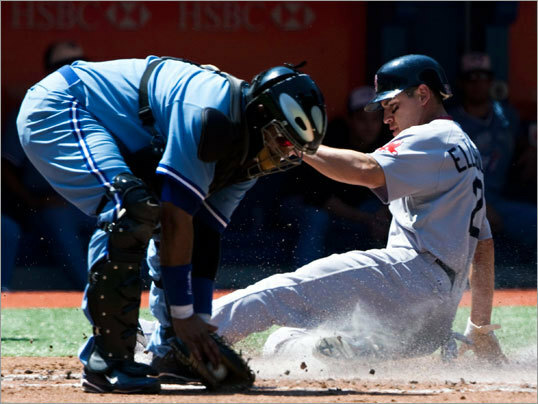 I honestly thought he would be much more Pedroia-like than that. Ellsbury, by the way, is officially the American League’s Comeback Player of the Year. I can’t think of anyone who would deserve it more. He earned every last bit of that honor this past year, so hats most definitely off to him. Add to that the fact that the signing of Crawford was largely a push from Theo over which the brass was divided. If you ask me, I would have said it was the other way around. Crawford’s strengths, both in practice and in numbers, aren’t that compatible with sabermetrics, the philosophy used to build the team. So I thought that we would all find out that it was Theo who was against it, and it was the brass who was pushing him to sign Crawford because of the wow factor of bringing in a star or something. All in all, the team this year turned out to be one big, dysfunctional family on every front. Nobody, from the players to the brass, was spared. Everyone who had issues let them loose at exactly the wrong time and in exactly the wrong ways. Players on whom you depended to carry your team through the stretch in the clubhouse either withdrew or sunk to the level of the players you never thought would sink to that level in the first place. It seems like it was just an awful atmosphere completely non-conducive to anything positive or constructive. Obviously you’ve got to consider sources of this information when you read stories about this, but I guess now that we know the end story, we saw the signs all along. That’s true of Theo’s departure as well. At the time to us on the outside, all of the signs were too subtle for us to keep putting two and two and two and two together to come with what is clearly a very elaborate set of social circumstances that spiraled out of control and led to our painful and epic downfall. Organization chemistry, both in the clubhouse and in the front office, is a very difficult thing to fix and cultivate. It’s organically grown, and you either have it or you don’t. You can’t force it. Now Papi is claiming that he’s seriously considering free agency as a way to escape all the drama. It’s all been meshing so well recently; how, in such a short time, could we become “that team” with all the drama? It’s like a soap opera. Seriously. John Henry even drove down to 98.5 The Sports Hub on Friday completely on his own because he felt like he had some records to set straight. He said that Crawford was not signed to boost NESN ratings, although he confirmed that he did oppose it but ultimately approved it because baseball operations were for Theo and Larry to govern. Henry also implied a confirmation that Theo is going to Chicago while saying that he wishes that Theo would stay. He said that, during the season, he let the brass know that he was all in favor of picking up Tito’s options and that the only time he thought that that maybe wasn’t such a good idea was when Tito told the brass that he didn’t want to come back. Significant changes to the organization could potentially be afoot, and that’s either good or bad. There’s no way to know who’s on the radar or what we should expect. There’s nothing to do. No amount of speculation would ever shed any light because this organization keeps everything under wraps, as is appropriate and right even if it is annoying for us fans hanging in the breeze. The whole situation is crushing. Make absolutely no mistake whatsoever about that. It’s crushing. It’s devastatingly epically crushing in every conceivable sense. We’ll get through it because we’re Sox fans and we always do, but it’s just so remarkably and epically depressing and crushing. I can’t even believe that this whole situation is happening. Ultimately the big question is short and sweet and simple but revealing of the trepidation that’s currently racking all of us. Also, Scott Williamson is auctioning off his 2004 World Series ring. Why in the world would you ever do that? That’s completely sacrilegious. In other news, the Pats summarily disposed of the Jets, 30-21. Would I have preferred a blowout? Obviously. But hey, that score is a lot better than the score we put up against them the last time we played them last season, so I’ll take it. And the Bruins, since beginning their season on October 6, have beaten Philly, Colorado, and Chicago and have been beaten by Tampa Bay and Carolina. We have a less than a month until pitchers and catchers report. This is the home stretch, people. Less than a month. It’s been a long winter. It’s been too long a winter. And like I said, the last few weeks are the most difficult, but we got this. We can see the light at the end of the tunnel. Only a few more weeks and then before you know it, it’s Spring Training followed by Opening Day. I’m psyched. Meanwhile, Marco Scutaro is officially our starting shortstop. This is not surprising. But it’s not like Lowrie isn’t going to get any playing time. Trust me on that. Theo avoided arbitration yet again. Also not surprising. Paps and Ellsbury each have one-year contracts for twelve million dollars and $2.4 million, respectively. This is the third time we’ve signed Paps to a one-year deal, and I think that speaks to his wavering performance. Three years ago he was golden, two years ago his walks were up, and last year just wasn’t a good year for no particularly apparent reason. It’s going to be really interesting when he becomes a free agent for the first time. I have no predictions for that because Paps hasn’t given us much reliability to work with. This is a contract year, but so was last year. He has some competition from Bard, but he did also last year. The only impactful external difference is Bobby Jenks, who represents more competition and more insurance. Or maybe Paps will just return to form after making various adjustments and working on various pitches, which is obviously preferable because that would show some future value we can more easily project. As far as Ellsbury is concerned, that’s a steal. That’s as good a bargain as you’re going to get. He played in eighteen games last season due to his injury, so that’s a pretty hefty raise from his previous salary of slightly less than half a million. So don’t get used to it. He’s a good player with a ton of worth, and if he stays healthy and has a good year this year, $2.4 million will seem like peanuts compared to what we’re going to have to shell out to keep him here. I would just like to note that our payroll for 2011 will be somewhere around $163 million total, which is close to what it was last season. It’s all about responsibility and financial flexibility. And only Theo would be able to maintain both of those and still make two major signings, one with a large contract and the other hopefully with a similar one pending. In other news, the Bruins played back-to-back games with the Canes earlier this week. We won both. First, we shut them out, seven-zip. It was awesome. They had no chance whatsoever. Then we beat them again, 3-2. Then we lost to the Sabres, 2-4. Then we beat the Avs, 6-2. Milan Lucic and Brad Marchand each scored twice. Barring that one loss, I’d say it was a good week. For hockey, at least. Because finally, last but not least, the Patriots. Let’s get this over with. The Patriots were eliminated from the playoffs by the Jets. There will be no Super Bowl this year because we scored only two touchdowns en route to a 21-28 loss. For the first one, Brady threw a two-yard pass and then went for a two-point conversion, and that was it. The rest we accomplished with field goals. And there were sacks. There was an interception. He set a league record of 335 passes this season without an interception, and yet somehow there was an interception. We had the best record in the entire NFL, and we lost our third straight postseason game. I hate to say this, but it felt a lot like the Pats-Giants Super Bowl, where we spent the entire season basically steamrolling over everybody, but when the final moment came, our ridiculously good offense was matched up against a defense that was just as good, and our defense didn’t match up as well to their offense. That’s kind of what happened here. It was just surreal and incredibly disappointing. I had us winning the Super Bowl before the game even started. Well, what can you do? As we like to say, there’s always next year.